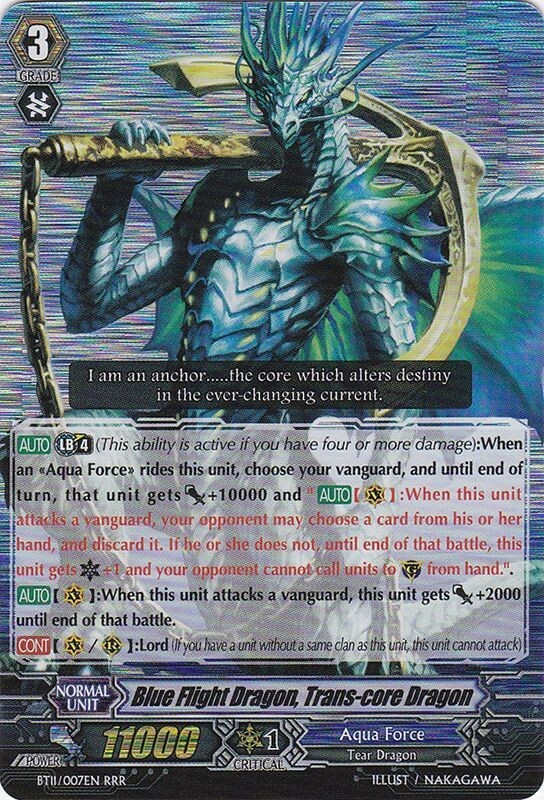 [AUTO](VC) Limit Break 4 (This ability is active if you have four or more damage):At the end of the battle that this unit attacked a vanguard, if it is the second battle of that turn, until end of turn, this unit gets "[AUTO](VC):[Counter Blast (2) & Choose two «Aqua Force» from your hand, and discard them] At the end of the battle that your rear-guard attacked a vanguard, if it is the fourth battle of that turn, you may pay the cost. If you do, [Stand] this unit.". The raging stream of battle spirit right back at you! Go wild, Storm Driver! 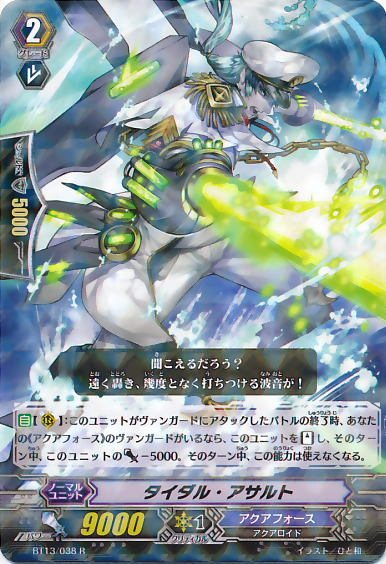 [AUTO](VC) Limit Break 4 (This ability is active if you have four or more damage):At the end of the battle that this unit attacked a vanguard, if it is the second battle of that turn, this unit gets "[AUTO](VC):[Counter Blast (2) & Choose two «Aqua Force» from your hand, and discard them] At the end of the battle that one of your rear-guards attacked a vanguard, if it is the fourth battle of that turn, you may pay the cost. If you do, [Stand] this unit." until end of turn. 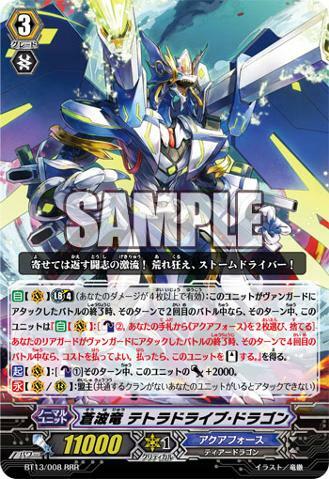 Blue Wave Dragon, Tetra-Drive Dragon is considered the premier main Grade 3 Vanguard of Aqua Force. That is not without a good reason. This post will touch on Aqua Force as a whole, and why Tetra-Drive comes out on top compared to the other Grade 3s. First of all, Let?s start with simple Pros and Cons. -The ability to attack twice in a single battle phase, without losing cards. -Ability to pay Counterblast (1) to help with Crossrides, or force more guards overall. -Incredible synergy with Transcore?s Break Ride skill. -Requires a specific field set-up, and requires many rear-guards. -Slightly worse in terms of offensive capability compared to other Vanguards who can attack twice. You might be wondering, Why Tetra-Drive? To answer that question, we must first ask, How does Aqua Force function? It should be known by now, Aqua Force?s gimmick is about the amount of attacks, and the orientation of the rear-guards, akin to an army, true to their nature. Although, only few members of Aqua Force trigger their effects based on how many rear-guards are rested with all of their members coming from BT11. Everyone else, triggers their abilities according to the amount of battles happened during that turn. Which is why, Aqua Force is typically a beatdown deck. You can?t blame them, with cards like Storm Riders, they may require less shields to guard, but every attack is still going to take at least 1 card from your hand, 5K or 10K. Aqua Force?s main purpose is basically draining your hand by forcing you to guard. This is why Transcore?s Break Ride skill is a discard or the VG gains a Crit, this is why Maelstrom has an on-hit minus that costs nothing until it actually hits and this is why, Revonn gains extra power and a critical to force you to guard. Now that we sufficiently understand the core concept of Aqua Force, it shouldn?t be surprising that cards that make your opponent throw away the most cards from their hand, is your Vanguard attacks. Which in turn means that Restanding Vanguards on average, eats up more guard than any other kind of card in existence. So which Aqua Force Vanguard will make your opponent?s hand bleed the most? Tetra-Drive of course. It doesn?t help that Transcore?s Break Ride skill triggers every time your Vanguard attacks, pushing Tetra-Drive into becoming THE ultimate solo Hand-burner. As stated earlier in the Cons section, Tetra-Drive requires a specific field, to facilitate it?s Limit Break. fortunately, Aqua Force specialize in having cards that allow you to accomplish 4 attacks without the use of Stand Triggers. These are the ESSENTIAL cards in a Tetra-Drive deck. Tidal Assault is THE best unit for triggering the skills of Aqua Force units TO DATE. There is no competition. It?s ability to stand itself after an attack is absurd if you have drive checked a trigger beforehand. This is also where Tetra-Drive stands above the others. Tetra-Drive gets to Drive-check ON THE SECOND BATTLE. Revonn can?t Drive-check until he?s the last one attacking with no standing units(Barring Wheel Assault) and Maelstrom has to be the fourth, this usually means your whole field is already rested. The potential to gain +5K power at pretty much the start of your battle phase is simply absurd. Not to mention, with Tetra-Drive requiring the second battle, the glory of the first will go to no other than Storm Rider, Diamantes. Before everyone freaks out, I?m not expecting you to run 3-4 copies of Diamantes, but running 0 is such a huge waste of potential it?s ridiculous. 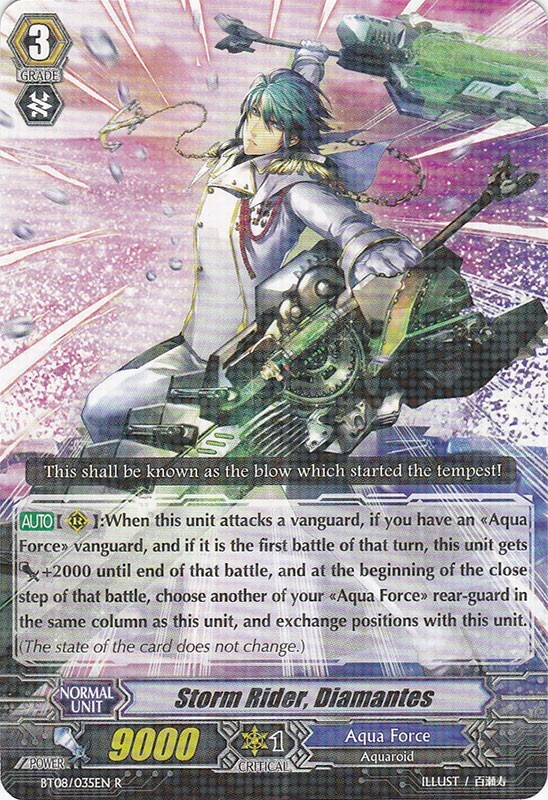 Back in Season 2, Aqua Force was incredibly deadly due to the amount of 10K Base power Vanguards. With the Basil and Benedict, you were basically forcing your opponent to vomit out cards profusely. With the new era of either 11K or 13K Base Power, Basil and Benedict have since fallen out of usage. But that should not stop Diamantes, for he attacks for 11K. Remember the previous part? You want your opponent to throw out more cards than they should to guard your attacks because you are attacking with multiple small strikes instead of one giant strike. Use Diamantes. Now. Tetra-Drive and Transcore. Do I really need to explain why you require Tetra-Drive in a deck ABOUT Tetra-Drive? It?s common sense, that Break Rides are the most deadly with Vanguards that can stand itself, it can use that extra 10K Power twice in a turn. But it does not end here. Due to the way Transcore?s skill is worded, it triggers everytime your Vanguard attacks, forcing your opponent to discard 2 cards ABSOLUTELY free, unless they wish to die. The synergy is literally on god-like levels, there is ZERO reason not to run this duo. 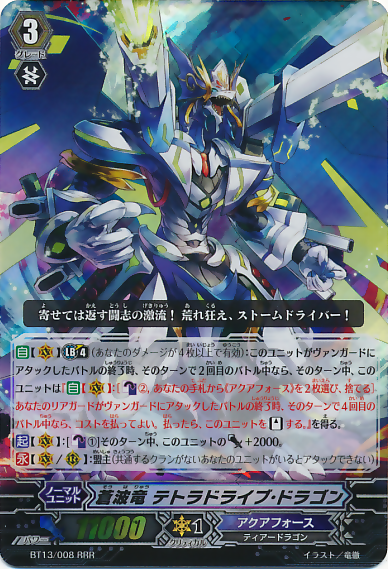 Glory Maelstrom, first things first, his Ultimate Break seals off the usage of sentinels, so his +10K power from Transcore is ASSUREDLY another card on the guardian circle. So what?s this? ?Discard?ing 2 cards ABSOLUTELY free(and by free I mean Counterblast 1) again? No. That is not why Glory Maelstrom is used as a TECH card in this deck. The real reason he?s here? Link Joker. The original card empowered by Link Joker, the ?hipster? Reverse if you will. Glory?s Ultimate Break UNCONDITIONALLY gives him +5K power and seals off the usage of Grade 1s and above (Barring Intercept). It is common Link Joker strategy to lock the card boosting your Vanguard and then proceed to throw a 10K shield in your face when you attack, which can only be broken by drive checking 2 triggers and giving both power boosts to your VG. They also like to discard Draw Triggers for effects like Chaos Breaker. If you?re slow and need it to be spelt out for you. THEY are ALL GRADE 0. This meant that the moment you Break Ride Glory Maelstrom, assuming the game has been going on ?fairly?. You?ll destroy them in a single blow because they don?t have enough Grade 0s to guard your attack. Penguin Soldier and Patrolling Jellyfish Soldier have the same stats, and both Soul Blast (2), the difference being that the Penguin draws you a card and Jellyfish unflips 2 of your damage for re-use. Since you?re Aqua Force, you don?t make sure of your soul and it?ll build up from simply riding all the way to Grade 3. So why not get some free direct or indirect advantage? Wheel Assault, for the cost of Counterblast (1) after boosting, you swap the positions of any 2 of your Aqua Force Rear-guards. First of all, clearly this assists in your attempts of using Tetra-Drive?s LB. Second of all, this card will help you combat Lock, by moving the unit trapped behind a locked front row unit, allowing it to attack and possibly allowing you to get 4 attacks even with a single locked front-row rear-guard. I hope you understand by now, why Tetra-Drive Dragon just fits the theme of Aqua Force so well and carries out his ?mission? so efficiently compared to his brethren. No discussion about this Card Review yet.